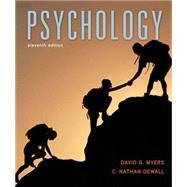 This edition of Psychology is accompanied by its own dedicated version of Worth Publishers’ breakthrough online course space, featuring a fully integrated e-Book, LearningCurve adaptive quizzing, a rich collection of student media resources, and easy setup, assessment, and course management options for instructors. I miss half.com but this seems to be a great alternative. Psychology: 5 out of 5 stars based on 2 user reviews.